This is going to be a busy weekend, so I wanted to consolidate some info here. Part panel, part open discussion and part professional development workshop, this event will offer resources and knowledge to young people trying to make careers as MCs, producers, DJs, singers, poets or other artists. How do you get publicity in the local media? How do you get posted on rap blogs? How do you book a tour, or even just a show? How do you manage your internet presence? Join established artists Mavin MC, Guante, Big Cats and TBA to talk about all this and more, and have plenty to time for open questions. IF YOU KNOW AN ARTIST TRYING TO START THEIR CAREER, PLEASE PASS THAT INFO ALONG. 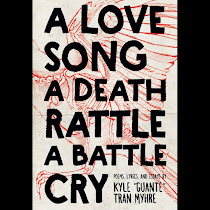 I'm performing a poetry set at 5pm along with Lewis Mundt. More info: the Second Annual G&S Festival promoting ART, POETRY, MUSIC, and COMMUNITY in the Midway. The purpose of the festival is to bring a multigenerational group of people from all ethnicities and backgrounds together to share expression, culture, conversation, and resources. In addition, the aim is to build community and connections between neighbors, schools, businesses, nonprofits, and artists through music, spoken word, games, theatre, speeches, resource & art booths, and a silent auction. I'm performing a music set at 6pm. 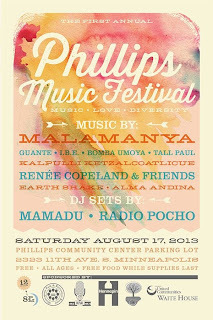 More info: An inner city music festival in the heart of the Phillips community that promotes love, diversity, and ultimately, music. This free all-ages event features an eclectic mix of local and global sounds with performances by Malamanya, Guante, I.B.E, Bomba Umoya, Tall Paul, Ketzal, Renée Copeland and Friends, Earth Shake, Alma Andina, and DJ sets by Radio Pocho and Mamadu(aka Toki Wright).